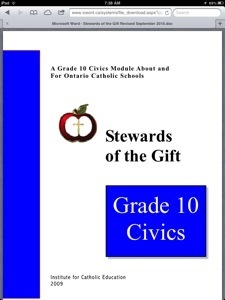 Stewards of the Gift is a mini unit for use in Ontario Catholic Civics courses for Grade 10. It was developed by the Institute for Catholic Education by Angelo Bolotta and Marc Kierstead. this curriculum is found on the ICE website along with supplementary resources for this program.